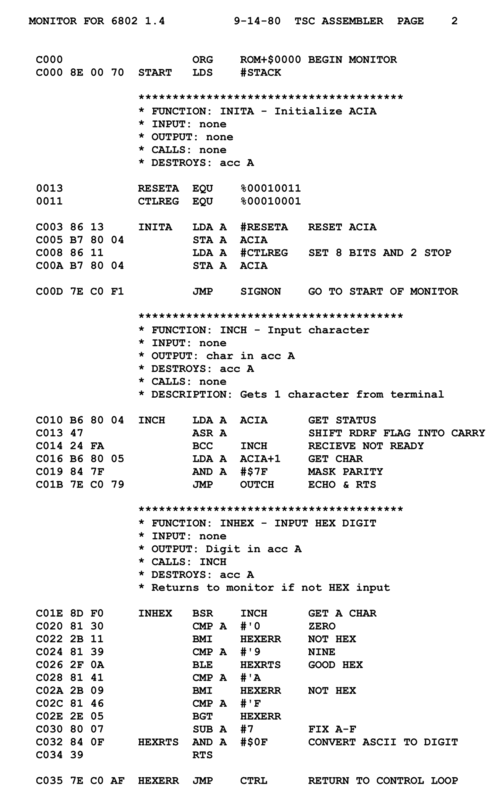 Macro file for assembly procedures used with high level languages. This file was tested with the Microsoft MACRO Assembler version 3.00.
letters. No one is likely to redefine these symbols. with the exception of the procedure names. frequently used control characters. TRUE = NOT FALSE (-1). The modifiers defined are B, LB, HB, W, LW, HW & D.
the order in which they were pushed. the stack. The $C macro tells it not to clean up the stack. is located on the stack. It also executes the PROC directive. the remainder of its parameters. be used in situations where this is inadequate. to the count of bytes to be popped from the stack, when applicable. versions) not all parameters will be popped from the stack. they can only be indexed by [DI] or [SI] and/or a constant. REMEMBER TO $SAVE; otherwise procedures do stupid things. Normally $SAVE is used after all $VAR variables have been defined. $IRET if it was dfined in $IPROC. procedure's BP if $SAVE was executed. parameters, only the parameters defined before it are popped. $IRET then generates the IRET instruction. executed and the parameter passed to it. except the $PASCAL/$C value for the next procedure.